Do you know how to prepare a meal for the next trip? Traveling in an adventure style will let you have an experience to eat outside such as campaign in a forest or a mountain . So, learning how to make easy camping meals can save you a ton of time on your next camping trip. Though outdoor cooking can be fun, it’s never good to miss out on other outdoor activities because you’re stuck making food for everyone. Use the following guidelines to minimize the work and time it takes to make great meals on your next camping trip. If there’s one essential item you need to make camp cooking easier, it’s aluminum foil. Almost any food item can be cooked quickly and effectively using it. 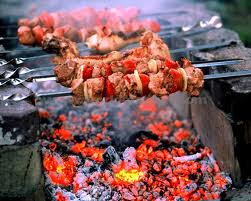 Simply wrap the food item in the foil, and place it on a grate over the campfire. Some of the most popular foods to cook with aluminum foil include hamburger meant for burgers and pasta dishes, whole potatoes, almost any type of vegetable, and chicken parts. Obviously, cooking times will vary depending on what you’re making. A good rule of thumb for this easy, all purpose campfire cooking method is to assume cooking times to be similar to that of using a grill. 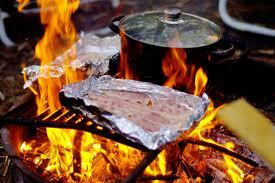 Read another post on uses for aluminum foil while camping to learn more. Before the invention of the microwave, people used more primitive heating methods to cook leftovers. Following this logic, preparing certain foods in advance can seriously cut down on time and effort spent cooking during your next camping trip. Before you leave, make some simple, hearty foods that fit nicely in the cooler and can be reheated easily over a campfire. Scrambled eggs, spaghetti, Hamburger Helper, and biscuits can all be cooked at home and stashed safely in Tupperware containers for later use. Best of all, their reheating time at the campsite is minimal, giving you plenty of extra time to enjoy the beautiful spot you’re camping at – wherever it may be. Let’s face it; non-campers are a little spoiled when it comes to cooking. With microwaves, stoves, and electric ovens at their disposal, they can prepare food a lot more quickly and easily. But you do have an advantage when it comes to campsite cooking; easy camping meals can be made even easier with the use of a Dutch Oven. An all purpose cooking vessel, the Dutch Oven has a tight fitting lid to seal in heat and a very sturdy construction. Almost anything that fits in one will cook nicely. Some popular easy camping meals to make in it include chili, beef stew, and just about any soup you can come up with. With a little preparation, making easy meals while camping really isn’t all that tough. So, instead of slaving over a hot fire for lengthy amounts of time on your next camping trip, employ the tricks above to allow more time for fun.